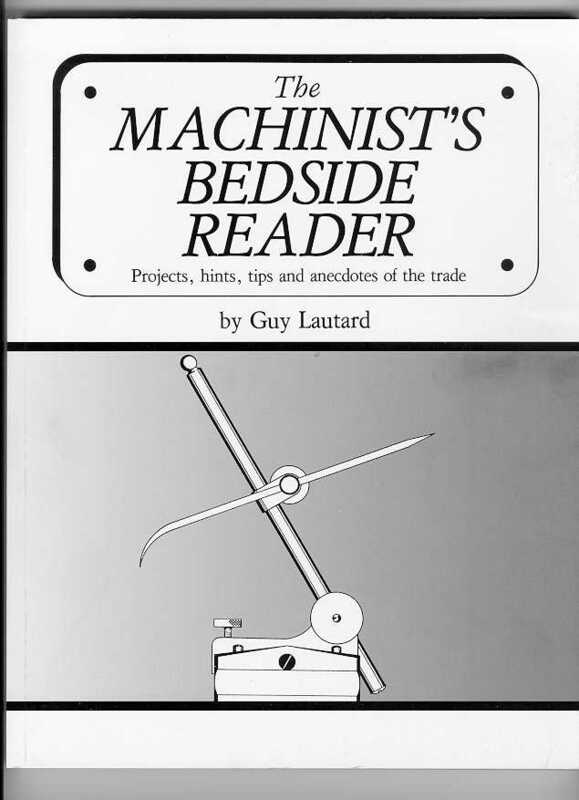 The Machinist's Bedside Readers and "Hey Tim..."
Now you can find those obscure points you know are somewhere in the 700+ pages of the 3 Bedside Readers (and if you have it, "Hey tim, I gotta tell ya....", which is currently out of print). Just think of key words concerning the subject you want to look up - from abrasives to workbenches - and you'll quickly have the correct reference(s)! It ran to just over 10 pages, so we used part of the remaining space for some good info updates. Customers outside US or Canada: C$10.50 ppd. Clockmaking for the Home Shop Machinist. Tables and Instructions for Ball and Radius Generation. I am working on new arrangements whereby these titles will hopefully once again be available. Please keep an eye on this website for further news regarding this matter in the next few weeks. videos, Guy's Index to the Bedside Readers, the Gruppo #1 CD, etc. PLUS you'll learn much useful shop know-how to help you get things done faster and easier in your shop. how to sharpen a center punch - properly. how to design and fit split cotters. how to hold thin work in the lathe chuck. You'll also enjoy the several machine shop anecdotes, and the fascinating account of a little lathe made "from nothing" in a Japanese POW camp. And you'll learn "The Secret of the Old Master," in a heartwarming story by Lucian Cary. 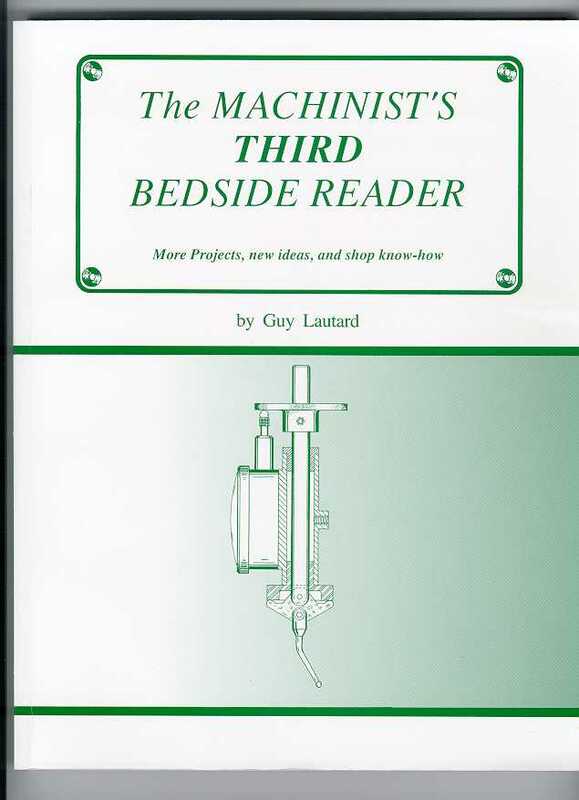 Click on this link to see the complete Table of Contents of The Machinist's Bedside Reader (which you can abbreviate to TMBR#1, if you like). US Customers: US$39.95 surface ppd. Add $4 for airmail shipping. Canadian Customers: C$39.95 (includes regular post and GST), (PST is not required for bound books). Customers outside US or Canada: C$45.00 surface ppd. Add C$20.00 for airmail for one book, and $12 for each additional book, should you want to purchase any of the other Bedside Readers or the J.M. Pyne Stories at the same time. Like the first book, TMBR#2 is filled with more hints, tips, and projects. an old gagemaker's methods for surface grinding and lapping for flat, square, and finish tolerances far beyond what normal machining methods can produce. yet another way of holding thin workpieces.....etc. This book also contains an enjoyable fiction story, The Bullseye Mixture, which incorporates complete information on the subject of pack casehardening. TMBR#3 contains even more pages, more photographs, and lots more neat stuff - projects, hints, tips, and technical how-to info you won't get elsewhere. A "Co-Ax" type indicator for use on your milling machine (and how to make and use edge finders, center finders, and "wigglers"). how to overhaul drill chucks, including how to do a deluxe overhaul on keyless drill chucks! And - If you want to learn how to sharpen reamers, you'll find out how in this book. You simply will NOT get this info anywhere else. fit a backplate to a lathe chuck? use an edgefinder to best advantage, and how to "Pick up" an edge in a hurry? hold a gib strip for machining? pull a tee in the wall of a pipe? get broken taps out of aluminum? knurl the edge of a rectangular block? file off that last half thou? 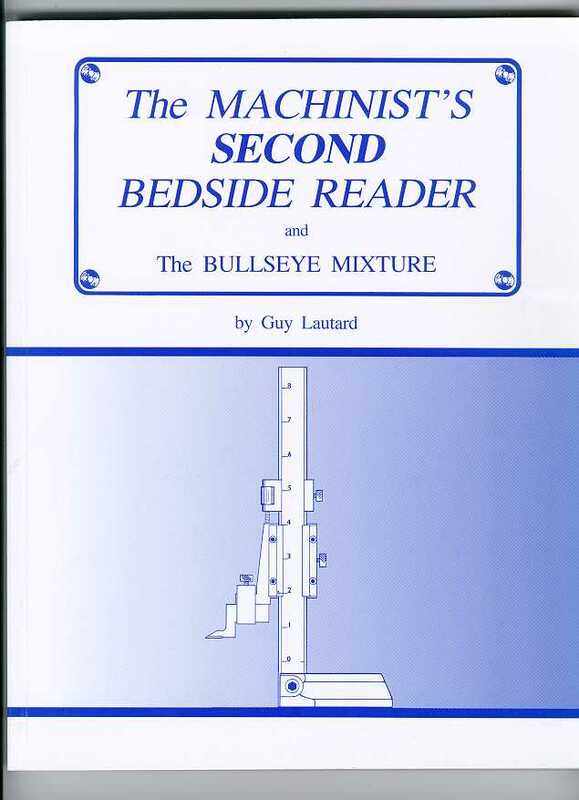 You'll find out the above and lots more in The Machinist's Third Bedside Reader. US Customers: US$45.95 ppd. Add $4 for airmail. Canadian Customers: C$45.95. (includes regular post and GST), (PST is not required for bound books). Customers outside US or Canada: C$50.00 surface ppd. Add C$20.00 for airmail for one book, and $12 for each additional book, should you want to purchase any of the other Bedside Readers or the J.M. Pyne Stories at the same time.